Getting ready for the New Year kept us busy this past week. 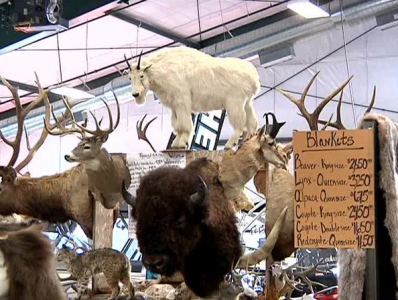 The Great Rockies Sport Show in Helena was this past weekend. We were happy to see a lot folks who listen to us on air and visit us on line. We debut the best of the best Guarantee Lure for 2013 at the show. This lure has been recognized by the Captain as the best guaranteed lure that he has sold over the past 14 years. The mustard color wiggle wart lure has caught trout out of Holter Reservoir, pike, walleye, and bass out of Fort Peck for the Captain last year alone. There is only a limited number of this lure that will be sold and when you buy two lures the Captain throws in a $10,000 Kits Tackle glass minnow jig for free. (It’s the same jig that Kit and Trevor Johnson used when they won the Canyon Ferry Walleye Festival last year and took home $10,000. Comes see us at the shows this year and we will also give you free a 2013 hunting date card for the Montana hunting season. Ice fishing reports have been good. The colder weather has been making some good safe ice and anglers are catching fish. Listen and read the reports we have for you on line and get and enjoy the fun. We want to welcome Erick Anderson the owner of Placer Motors in Helena as the sponsor of the statewide trivia. Erick and the Captain go way back, when the show first aired 14 years ago, they both did the trivia questions live whenever the Captain was in Helena. That is when Subaru sponsored the trivia question. Now Placer Motors, your statewide Subaru dealer is back where it all started, sponsor the statewide trivia question. “We are excited to bring trivia and be a part of the Montana Outdoor Radio and On line crew”, added Anderson, “we sell Subaru’s to folks all across the state so it makes sense to help bring them a great show that gives them information on the Montana Outdoors every week”. Darren Metcalf of Missoula and John Wurz of Galata were last Saturdays trivia winners as Erick Anderson and Trevor Johnson joined the Captain as he broadcast live from the Wingate by Wyndham hotel in Helena. Check out the West Yellowstone/Hebgan Lake ice fishing derby which will be held February 1-3 in West Yellowstone on Hebgan Lake.